Why do I get kicked from N!tmod servers with the following error message ? 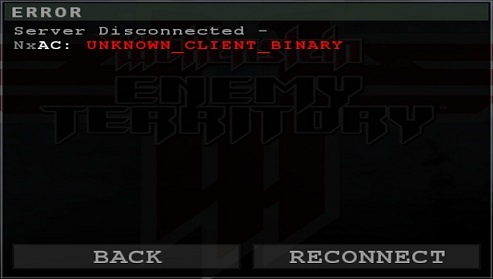 This happens with versions 2.2.1 and 2.3, when your game executable doesn't match the list allowed by the anticheat on the server you are connecting to. NxAC (N!tmod's Anti-Cheat) verifies the SHA1 checksum of your game executable in version 2.2.1 and 2.3 of the mod, and compares it to a list of allowed checksums that server admins have to update themselves on their server. It should not happen with any official ET client version. It can happen with brand new ET:Legacy versions, if the server admins did not update the checksums list.